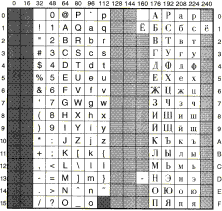 This chapter includes tables of all the alphabet sets available on your Acorn computer. Most are based on the International Standards Organisation ISO 8859 document. When you load an alphabet it overlays the previous alphabet. 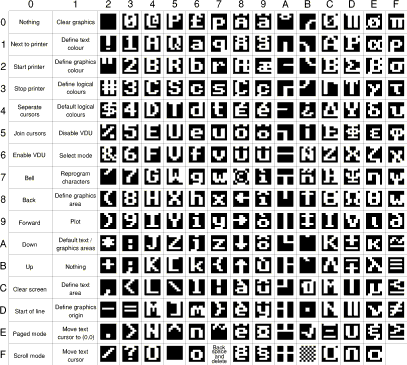 Most alphabets have a number of undefined characters, shown in the tables below by a light grey square. In such cases, the previous character definition for that code remains in effect. 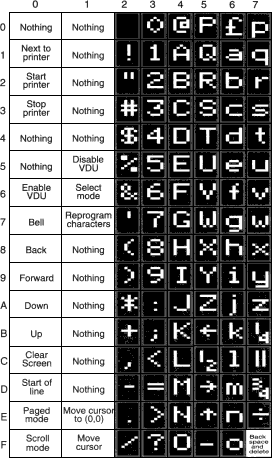 The character codes 0 - 31 and 127 are not printable characters; they have special meaning to the VDU drivers, as described in the VDU Drivers. They are represented in the tables below by a dark grey square. 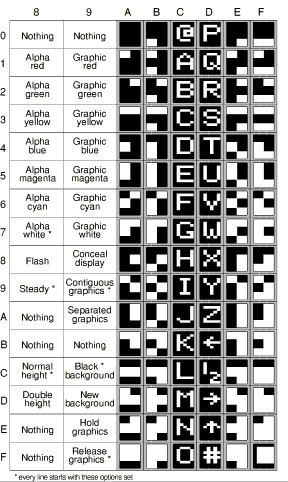 You can load alphabets using OS_Byte 71 or *Alphabet. When the kernel is booted it sets up a default alphabet. 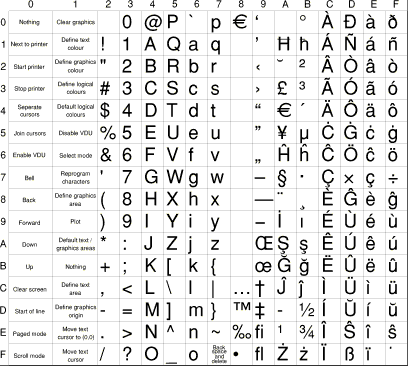 The kernel's default alphabet always contains all characters that are defined in the Latin1 alphabet for the release of RISC OS in use (see Latin1 alphabet (ISO 8859/1)). Note that this definition has been gradually extended by the addition of extra characters in the range &80 - &9F (128 - 159). 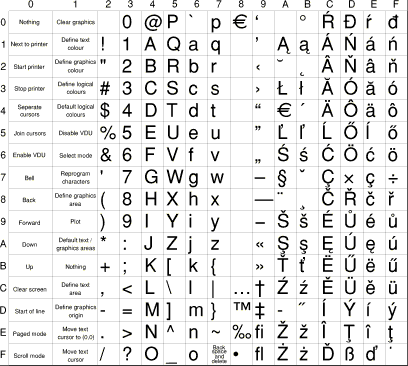 The kernel's representation of characters that are neither defined in the Latin1 alphabet nor used by the VDU drivers varies. 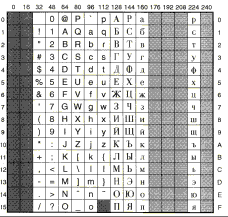 In RISC OS 2 they are represented by the underlined string 'These·characters·are·not·defined', and in RISC OS 3 by the hexadecimal value of their character code. 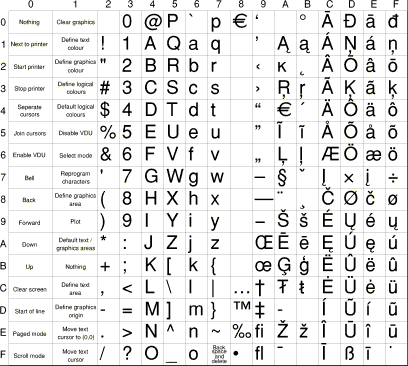 In the future some of these undefined characters may be used to further extend the Latin1 alphabet, or their representation may change. Furthermore, it is these characters that users are most likely to redefine if necessary. Consequently, you must not rely upon their initial representation. 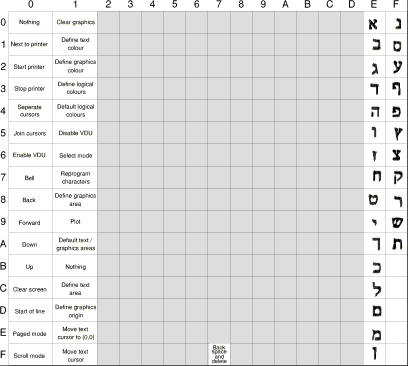 The default alphabet is then overlaid by the alphabet that is correct for the computer's configured territory, as set by *Configure Territory. Under RISC OS 2, the alphabet used is instead determined by the computer's configured country; see *Configure Country on *Configure Country. When the window manager starts, it redefines some characters. In RISC OS 2 these were used to draw windows' borders, and so have to be present for the desktop to have the correct appearance. Later versions of RISC OS still redefine some of these characters for backwards compatibility, but do not themselves use them. You must not rely on the presence of these characters unless your program is running under the desktop in RISC OS 2. Alt Ctrl F1 Selects the keyboard layout appropriate to the country UK. Alt Ctrl F2 Selects the keyboard layout appropriate to the country for which the computer is configured (if available). Enters the character corresponding to the character code typed. Press and hold Alt and Ctrl together. Still holding Alt, type on the numeric keypad the international telephone dialling code for the country you want (eg 49 for Germany, 39 for Italy, 33 for France). 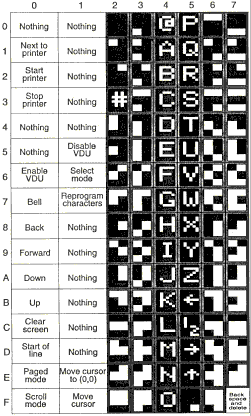 This is the default alphabet used by Acorn computers. 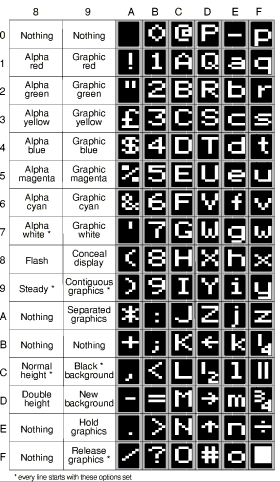 In RISC OS 2 characters &80 - &9F (128 - 159) are undefined. 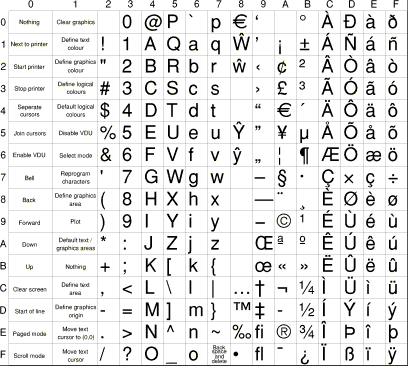 In RISC OS 3 (version 3.00) characters &80 - &8B (128 - 139) are undefined. This character set is used in the BBC Master microcomputer. It is retained for the sake of compatibility, but should not be used for new applications.